Nancy Johnson (J.D., M.L.S.) was the Law Librarian/Professor of Law at the Georgia State University College of Law Library. She formerly held positions at the University of Illinois and the University of Chicago. She taught both first-year legal research and advanced legal research. She also taught law librarianship in the Atlanta University Graduate School of Library and Information Studies. 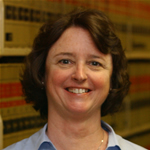 Prof. Johnson authored several books and articles on legal research and law library management and she authored two CALI lessons. Prof. Johnson was very active in AALL, SEAALL, ALLA, and the CALI Legal Research Community Authoring Group. In 2003, she received the CALI Excellence in Service Award.